Sawgrass Mills Mall offers gazillions (yes that is the technical term) of great shopping opportunities. 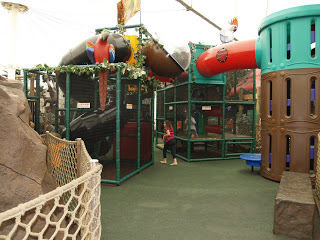 It has great kid friendly play areas and rides. Not to mentions store after store after store after store……………… (well you get the idea) of indoor and outdoor shopping. It’s freaking big! While the rest of the country is seeing the light at the end of the tunnel (the light being spring and the tunnel being winter) we are looking for things to do with the kids that include air-conditioning! 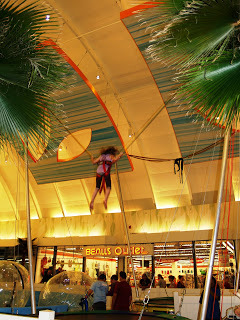 Here are 11 reasons to take the kids to Sawgrass Mills for a playdate. 1. Crowds: It’s less crowed on weekdays and far more fun! It does get pretty crazy on the weekends, so go early in the day if have to go on the weekends. 2. Air-Conditioning: I suppose I don’t need to explain the benefits of this one since our heat index can be well over 100 for weeks on end in South Florida. 3. Feed the kids for free: Okay, not really free, but with three different food courts, you can walk around and get samples enough to fill a 3 year old for sure! 4. Carousel: What more can I say?? What kid doesn’t like a carousel? 5. 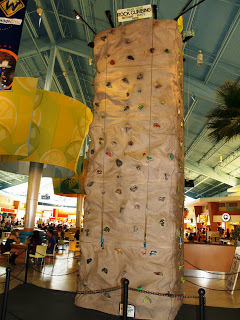 Climbing Wall: One more way to wear that kid out! We love the climbing wall! 6. 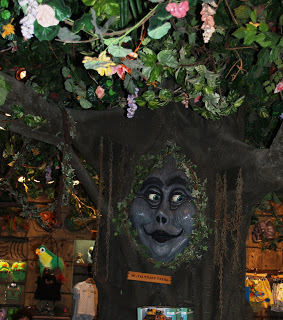 Sawgrass Mills Mall Rainforest Cafe and Store: We love to wonder around the shop and look at all the animatronic animals and cute stuff! Little ones and big kids a like love to look at the fish tanks too! They do have reasonably priced lunches and a kids menu. It’s like dinner and a show! 7. Walking: it’s a huge place and all the walking alone will wear out the kids (and you) so you can have a peaceful evening! mommy friends say they have seen it pretty dirty (Maybe during the busy times). There are lots of benches for the parents to hang out on by the entrance, so the kids can’t run off. 9. Coin Rides: I don’t know why, but these are so popular and the kids love them. My daughter loves them even when I don’t have coins for her. She just likes to climb on them! 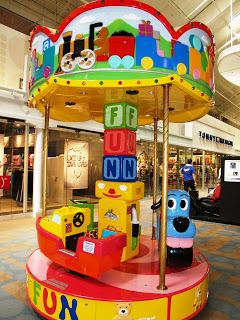 There is also a little Coin op Carousel in the mall (can’t remember where) that rides 3. It’s great because there are usually other kids on it and if each parents donates coins the kids get to ride longer. 10. Bungee Jumping: If the kids still are not tired just strap them up to bungees and let them wear themselves out on the trampolines. You actually get a decent amount of time on them especially if there is not much of a line behind you! This is guaranteed to wear the kids out! 11. Air-conditioning: Did I mention this one already? Well it’s important! 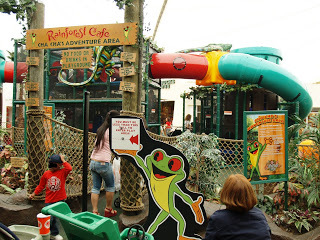 This entry was posted in Events and Reviews, Florida, Summer Picks and tagged bungee, childrens play place, Fort Lauderdale, kids play area, kids rides, mall, Mall Rides, play place playground, Rainforest Cafe, sawgrass mills, shopping center, shopping outlets, South Florida, south florida mall, Summer Activities, trampoline by Cynthia Buckley. Bookmark the permalink.